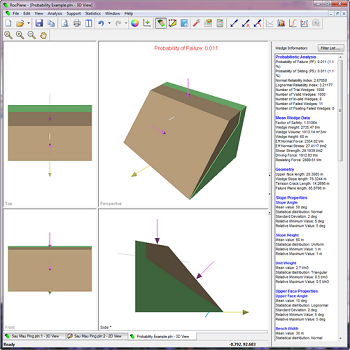 An essential part of your rock slope analysis toolkit, RocPlane is an easy-to-use tool for planar wedge stability analysis and design. RocPlane is an especially useful tool for geotechnical engineers analyzing bench stability in open pit mines and rock slopes. RocPlane also includes functionalities for easily analyzing results, generating figures and charts, and producing convenient summaries of models and results. The report generation features of RocPlane are especially useful to engineers when writing reports with high quality and professional-looking drawings and diagrams. 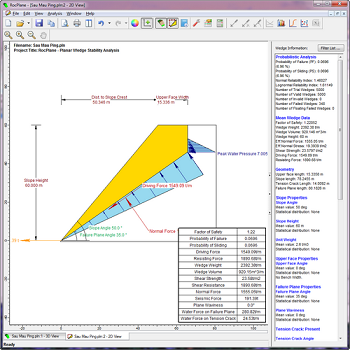 They help slope designers readily communicate findings to people with varying levels of slope engineering knowledge. Bolts can be added to the model with the Add Bolt option. An average support or loading pressure can be defined with the Pressure option. A force can be applied to the wedge with the External Force option. It is important to remember that all of the methods of modeling support in RocPlane simply represent different ways of applying a force to the wedge. Like all other forces in the RocPlane analysis, support forces are applied through the centroid of the wedge and are specified per unit width of slope. In RocPlane v3.0 you can carry out probabilistic analyses, where you can define statistical distributions for input parameters, to account for uncertainty in the input parameter values. 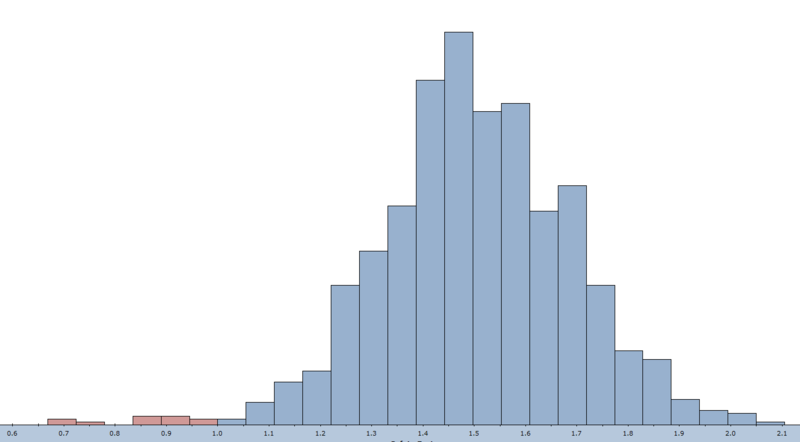 A probabilistic analysis will provide you with a safety factor distribution and a probability of failure. An important new addition to the probabilistic analysis capabilities in RocPlane is the ability to define variability of the failure plane shear strength, with respect to the mean strength envelope, rather than the individual strength parameters. This simplifies the probabilistic definition of shear strength and avoids the issue of statistical correlation of random samples of multiple input parameters. You can still define statistics for individual strength parameters; or you can use the new option based on the mean envelope. The Minimum Wedge Size option allows you to exclude the analysis of very small wedges which may be generated by a Probabilistic analysis. This option is useful because very small wedges can sometimes give misleading analysis results (e.g. very low safety factors) and may be difficult to see on the model (e.g. very thin slivers). In general, it is larger wedges which are of the greatest concern in a Roc Plane stability analysis. 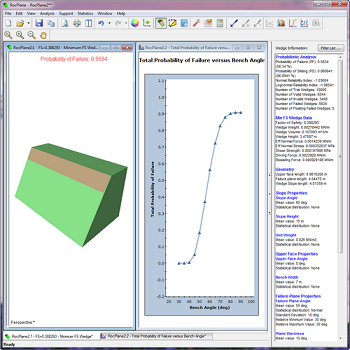 Although the Minimum Wedge Size option is OFF by default, it is recommended that this option is enabled for Probabilistic analysis to filter out the analysis of very small wedges.